Adapting to changes in the marketplace is the difference between sinking or swimming as a business. 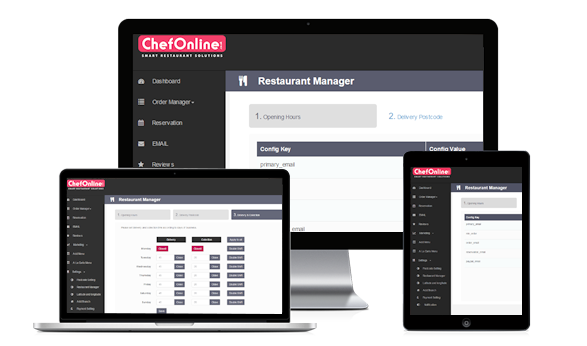 ChefOnline online platform gives restaurateurs the tools they need to assess consumer trends, monitor which of their products and services are performing the best, and respond to feedback from customers. However, all of this is useless if you cannot easily access, compare, edit and post new content. This is why we have developed our intuitive and easy to use control panel, to give you – the business owner – the power to get the most out of our services. Let us say that your team is devising a new promotion or deal to mark an upcoming event. You need to assess the cost and subsequent benefit of such a promotion, so you visit our control panel and view sales information and customer feedback for similar promotions you may have run in the past. Then you look for information on customer trends, to see what popular dishes and products you can include in your promotion. You can also review what promotions you have run recently, to ensure that your promotion is fresh and interesting to your customers. With the planning stage now complete, you need to get the word out there as quickly as possible. Time is money and getting the jump on the competition is vital to a successful promotion, so you simply log into the control panel once more, upload your promotion, select accompanying images from the asset store and set the promotion as live online. Presto, your advert is ready to do its work! Furthermore, all your data is secure. Staff are assigned passwords that enable access to a specified level of the control panel, ensuring that your transaction data, sales data and customer feedback are securely stored until you need to use them. For a safe, secure and simple user interface, look no further.